With all the talk around these days about cannabis legalization and the numerous health benefits that has already brought to hundreds of thousands of people around the world, the fact remains that some people aren’t about getting high. Many folks, including children and the elderly, want to remain focused and not feel the heady, sometimes confusing effects of THC; the component inside cannabis that makes you feel high or stoned. That’s why CBD – THC’s baby and far more innocent brother is getting all the attention these days. CBD is the shorter name for Cannabidiol, a compound inside the cannabis plant associated with pain relief, as a cure for insomnia and with a feeling of general wellbeing. There are also significant clinical studies on mice that have shown a connection between CBD and healthfulness in humans. CBD comes in many different forms and can be taken either via the stomach – by ingesting edibles like gummy bears and cupcakes; or by taking it in drops under the tongue. Other people opt to vape CBD in an E-Cigarette type device for the most immediate effects. But the main thing about CBD is that it won’t get you high; not even slightly high. You may have heard about CBD as it’s the fastest-growing natural alternative to pharmaceutical drugs around, as many people discover the numerous benefits of this amazing, natural compound. CBD relieves the symptoms of anxiety, insomnia, and also contains anti-inflammatory properties associated with pain relief. Whatever form of CBD you ultimately decide is the best choice for you, always make sure you are buying THC Free CBD Oil from a reputable vendor like the ones featured below. 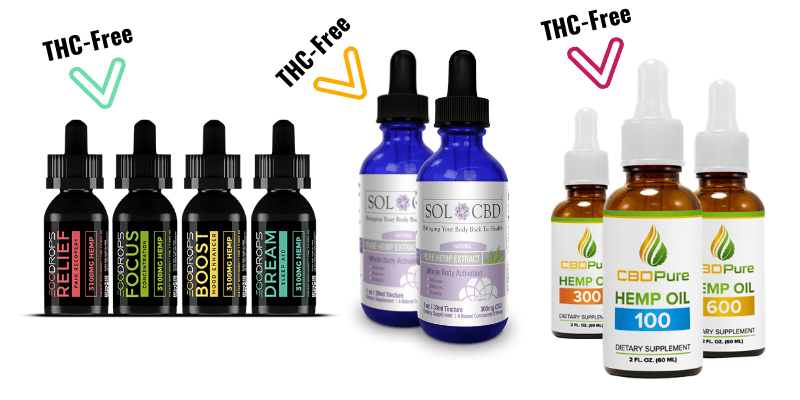 When it comes to getting the best THC free CBD on the market, SOLCBD Tincture, CBDPure Hemp Oil 600, and EcoDrops Relief by CBD Drip are three products you can trust from some of the best online stores. SOLCBD is the lovechild, so to speak, of Oksana and her husband Larry. The Las Vegas-based couple had been working hard within the natural health industry for 8 years until they came across CBD. Already very active across numerous health and personal development blogs – aimed at educating people how to upgrade and improve their lives healthfully – CBD was a natural path for this couple as well as a smart business move. SOLCBD are at the cutting edge of the emerging CBD industry and are committed to creating the very best CBD products around. Their commitment to quality and safety, as well as great prices, makes SOLCBD a natural first choice for anyone curious to try CBD. 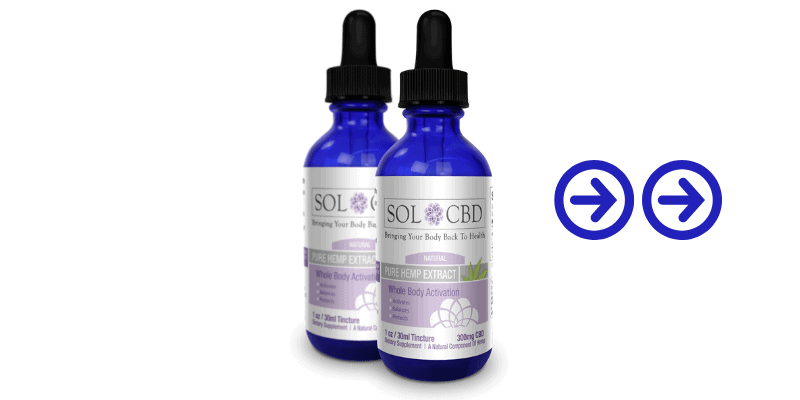 SOLCBD’s Tincture is derived through an expert CO2 extraction process, using only the finest quality hemp plants. The CBD extract is then carefully blended with MCT oil – fats that are naturally found in coconut oil and the easiest of the fat chains for humans to digest. The MCT oil also improves the bioavailability of the CBD meaning it enters the system quicker and more efficiently. All of the CBD used by SOLCBD is organically grown in the USA, is Cold Processed using CO2 Extraction, and contains absolutely zero solvents or other potentially harmful chemicals. Another reason to choose SOLCBD TIncture is that they are totally transparent when it comes to their third-party lab results. On their webpage that sells their proprietary tincture, the lab results are all displayed clearly so you can rest assured that you are receiving totally THC Free CBD Oil that won’t be getting you high. CBDPure offers some of the best-quality CBD Oil in the world, all grown locally on the best hemp farms in Colorado. CBDPure is particular not to use any harmful pesticides and herbicides in their products. They specifically choose their product for its high-CBD content, while all of their products are both tested and certified by a third-party lab on a per-batch basis. CBDPure’s flawless and strict manufacturing guidelines and stringent quality control protocols ensure that their customers receive the best CBD on a consistent basis without any need for second guesses. All their certified lab test results and reports are available for each lot and batch number and are obtainable on request. CBDPURE Hemp OIl 600 has been specially formulated for people who want to maximize their health and sense of wellbeing and calmness. 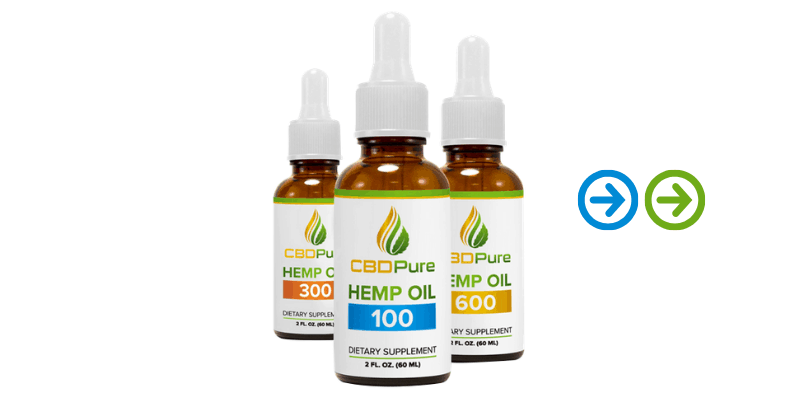 Each serving of CBDPure Hemp Oil delivers 20mg of CBD along with totally natural hemp oil. The product has a natural hemp-type flavor and is pleasant on the palate and almost tasteless. But it’s the customer reviews that are most impressive, coming from real people who have benefitted from this great CBD Oil. Then there’s a testimonial from Colling from Dodge City, KS. “I love music. Playing my guitar again is now a reality and not just a daily dream. CBDPure helped bring my passion back to life and I’m now playing weekly gigs in a band with no issues.” He wrote. When it comes to finest-quality CBD, CBDPure Hemp Oil 600 is a great choice. EcoDrops Relief by CBD Drip is a top-shelf product for the more discerning CBD user out there. The tincture all starts with the finest full-spectrum CBD, from the most reputable hemp farms across Europe. The CBD hemp oil extract is lab tested for quality assurance and is non-GMO, vegan and completely gluten-free. EcoDrops uses a special CO2 supercritical extraction method in order to extract the CBD, terpenes, vitamins, lipids, nutrients and other compounds in the purest and most efficient way. The company is proud of what it calls its “master-crafted unique blend of terpenes engineered for relief and pain recovery.” They also use some fractionated coconut oil (C8 Capric Acid & C10 Caprylic Acid) in the mix, delivering a unique blend each and every time. Each 30mg bottle of EcoDrops Relief by CBD Drip contains around 9300+mg of Hemp Oil Extract, 1500+mg of Active CBD or 50+mg/ml of CBD Concentrate. At the same time, Geraniol, Myrcene, Humulene, Limone, and Eucalyptol are some terpenes you can expect to find in this one. EcoDrops Relief 30ml bottles by CBDDrip also contains, Vitamin E, Omega-3, Omega-6, plant sterols, and other essential nutrients. They recommend 3-10 drops under the tongue as a good starting point, depending on your specific need. 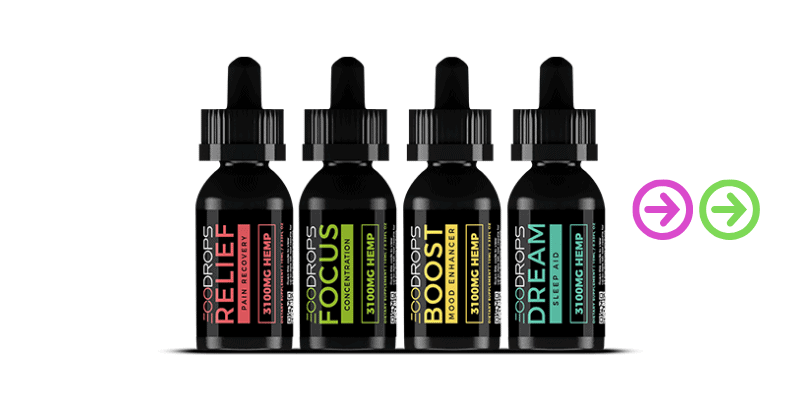 If you’re looking for the ultimate THC-Free CBD Oil, look no further than EcoDrops by CBD Drip, or check out their website and numerous great reviews. When choosing which THC-free CBD Oil to buy online make sure you have access to third-party lab results. Any reputable CBD company worth their salt would be happy to share those results with customers; just look out for the ones who don’t.